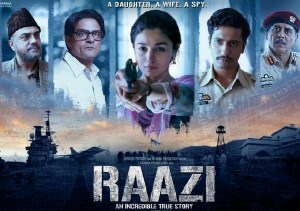 ‘Raazi’ is the true story of a Muslim girl Sehmat (Alia Bhatt) – a naïve and inexperienced Kashmiri whose life changes when her father Hidayat Khan (Rajit Kapoor) seals her fate as an Indian spy. She undergoes rigorous training under Indian intelligence agent Khalid Mir (Jaideep Ahlawat) before being married off to Pakistani Army officer Iqbal Syed. On the other side of the border, Sehmat gradually assimilates into Iqbal’s family to uncover vital information while keeping her real motives hidden from them. The film is an adaptation of Harinder Sikka’s novel Calling Sehmat which is inspired by real events.